The famous New York City street crossing was captured shortly after Morris Frank and Buddy returned from training in Switzerland. MORRISTOWN, N.J. – On January 29, the oldest guide dog school in the world will celebrate 90 years of working to enhance the independence and dignity of people who are blind and visually impaired. Founded in 1929, the 501(c)3 non-profit pioneered the assistance dog training movement and rights to public access in the United States. 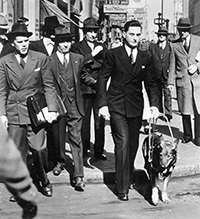 The Seeing Eye’s co-founder Morris Frank and his Seeing Eye® dog Buddy are credited with paving the way for the nationwide acceptance of service dogs and the drafting and subsequent passage of the Americans with Disabilities Act, which grants the right of public access to people assisted by service dogs. Today, The Seeing Eye continues to honor the legacy of Morris Frank and Buddy by educating the public about the rights of people with disabilities and pursuing legislation that will protect guide dog teams. “I know our founders would be proud of what they set in motion 90 years ago. We look forward to the next 90 years, and beyond, as we continue to be an innovator and pioneer in the field of breeding, raising and training outstanding Seeing Eye dogs for people who are blind and visually impaired,” added Kutsch. The Seeing Eye will be hosting a 90th Anniversary Gala on May 7, 2019 at Natirar – Ninety Acres in Peapack, New Jersey. Each year, approximately 260 people from across the United States, Canada and Puerto Rico, come to Morristown, N.J. to train with a new Seeing Eye® dog. The Seeing Eye tuition is $150 for the first dog, $50 for each subsequent dog, and just $1 for veterans of the military. The tuition covers the dog, travel expenses, room and board, specialized training in the care and use of their dog, and the dog’s equipment. The rates have been unchanged since the early 1930s, despite the cost to breed, raise and train a Seeing Eye dog rising to more than $60,000 today. The funds to cover the expenses are donated by private individuals, corporations, bequests and other planned gifts. Established in 1929, The Seeing Eye provides specially bred and trained dogs to guide people who are blind. Seeing Eye dog users experience greatly enhanced mobility and independence, allowing them to retain their active lifestyles despite blindness. The Seeing Eye is a 501(c)3 non-profit supported by contributions from individuals, corporations and foundations, bequests, and other planned gifts. The Seeing Eye is a trademarked name and can only be used to describe the dogs bred and trained at the school’s facilities in Morristown, N.J. If you would like more information on The Seeing Eye, please visit the website at www.SeeingEye.org, call (973) 539-4425, or email info@seeingeye.org.